Charles Aranguiz dreams for Arsenal move Chilean midfielder Charles Aranguiz has revealed his dream to play for Premier League side Arsenal, according to ESPN. Chilean midfielder Charles Aranguiz has revealed his dream to play for Premier League side Arsenal, according to ESPN. 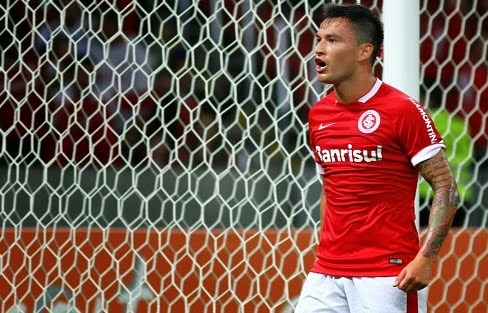 Charles Aranguiz who is an important player for his Brazilian side Internacional is hoping to join the Gunners in the near future. Aranguiz is international teammate of Alexis Sanchez and is hoping Sanchez to help him in his dream move. He is keen to join Premier League as he is confident that he can shine well in England. The 25-year-old is a regular player for Chile, he was also the part of last year’s World Cup squad. He scored the goal in a 2 – 0 win over Spain. Aranguiz has made 31 appearances for Chile since his debut. Aranguiz who has been linked with several Premier League sides was quoted by Daily Mail when asked about Arsenal. The player is not sure about his future as he reveals that nobody has contacted him. Daily Mail believe that a bid around £5million would be enough to add another talented midfielder in Arsene Wenger’s squad. So far this season, he has scored six goals and assisted three in 23 appearances for his club.